Made from very lightweight Oxford Cloth, this shirt was designed for one of my clients. 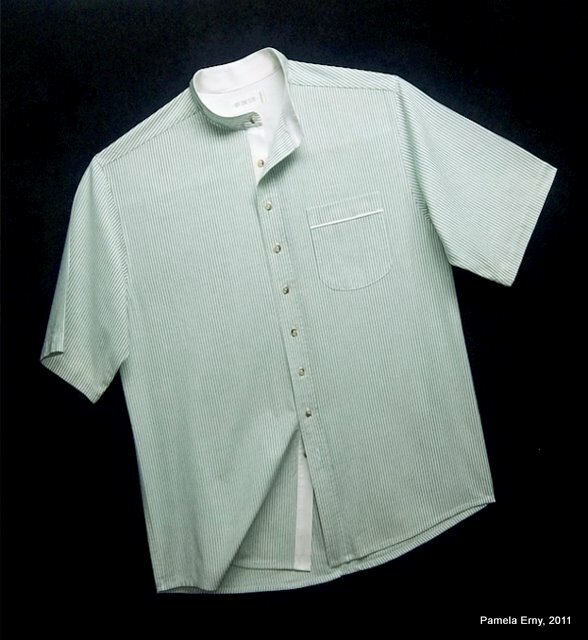 Since he lives in the tropics and does most of his business poolside, he wanted a shirt that was loose and breezy with "just a little hint of businessman". That is why I chose the lightweight oxford stripe, but used it in a very casual way. I love this style, Pam. How excellent for "businessman by the poolside"! I was looking through the "More shirt patterns" link and looked at the seersucker with the bias details. You one AMAZING fabric wrangler! Beautiful shirt! How excellent for the businessman to have you to sew for him. Now that is one great shirt! Can see why DH wants one to call his own. I've had many of Pam's shirts for years - since before she moved back to New York. They are well made, very durable, and last for years. The quality is excellent. Pam the subtle curve to the hem is just beautiful. This is a shirt meant to be worn untucked yes? Like a guyabera? Thank-you Phyllis! Yes it is meant to be worn untucked. This was made for a King-size guy, and the gentle curve looks better (imo) than a straight cut on a big man. Pam, thanks for the sleeve tutorial, this came at a time when I was working on my own camp shirt for the summer and I am using a basic long sleeved pattern that I like ( Brensen Pattern Sew Simple a quick sew) so, I had wanted to know how to make a very attractive short sleeve,, this is just perfect timing! Thank you for your many tutoirials, I know many of us a better sewists because of your teaching!